The purpose of this page is to document some aspects of Skyrim that are specific to the Nintendo Switch version of the game. The vast majority of gameplay is identical on all platforms (PC, Xbox, PlayStation, or Switch): the quests are the same, and the glitches are the same with the exception of lag issues being less prevalent on PC. 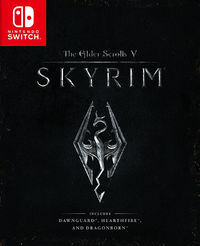 The Nintendo Switch version of Skyrim was released on November 17, 2017, with all DLC included. It is based on the Special Edition and contains gameplay features and patches incorporated into that release. The Switch edition also features motion controls and compatibility with Nintendo's "amiibo" figures. The console. This means that in many cases bug fixes that are used by PC players are not available to Nintendo Switch players. It also means that most cheats and exploits are not available. Mods cannot be used on the Nintendo Switch version of the game. Achievements are not present in the Nintendo Switch version of the game. 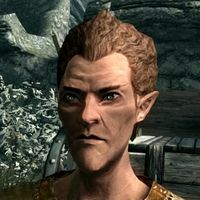 Random events added by Dawnguard where vampires would attack settlements have been removed from the Nintendo Switch version. Bosmer have been given an additional eye color option at character creation: blue, man-style eyes. Motion controls are available for fine-tuned aiming with archery and spellcasting. Gesture controls are available for melee combat. Swinging the left or right joy-con controller will attack with an equipped weapon in that hand or block with an equipped shield. Swinging more forcefully performs a power attack or shield bash. Gesture and controller rumble have been incorporated into lockpicking. While standard left and right thumbstick controls can still be used, holding ZL and rotating the left joy-con will rotate the pick, while holding ZR and rotating the right joy-con will attempt to turn the lock. Rumble represents the lock as a series of "notches," vibrating as the pick rotates across them, with a slightly stronger vibrating effect on the notches surrounding the sweet spot. The more difficult the lock, the more notches are present. This can make lockpicking substantially easier than on other versions of the game. On the Nintendo Switch there is no way to toggle Automove. Walking vs. running is controlled by how far forward you push the left thumbstick. Slight motions of the thumbstick will cause your character to walk; pushing the thumbstick as far as it will go will cause your character to run. (This is most obvious if you use third-person view). The Quick Save and Quick Load shortcuts, as well as a number of other shortcuts only available on the PC, are not available on the Nintendo Switch. Save, Load and Quick Save are only accessible through the Menu options. There is no downloadable content for the Nintendo Switch version. As in other Special Edition releases, all three official add-ons are already included, and cannot be disabled individually. Three items based on The Legend of Zelda: Breath of the Wild are available in the Nintendo Switch edition of Skyrim: the Master Sword, Hylian Shield, and Champion's Tunic. They can be obtained either through chests summoned with the amiibo power, or found in a hidden chest on the Throat of the World near the Word Wall without requiring any amiibo. All items can be improved through crafting, and can be enchanted. Tempering requires 4 refined moonstone ingots. Uses three armor slots when equipped: armor, bracers, and boots. One feature unique to the Nintendo Switch version of the game is compatibility with Nintendo's "amiibo" figures: you can tap your amiibo figures against the Switch for a treasure chest of items to appear in-game. 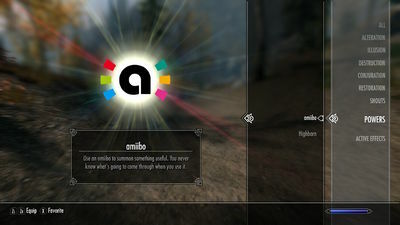 This is done by equipping the "amiibo" Lesser Power (found in the Magic menu, under "Powers") and casting it at the ground, where a glowing circle will appear, and then tapping the figure to the right Joy-Con controller. This can be done once every 24 real-life hours per amiibo. Legend of Zelda figures released after May 19, 2017: 20% chance for one of the three Zelda-themed items, plus armor, arrows, fruit, and/or weapons. The chance of getting one of the Zelda items will increase with 5 compatible amiibo taps within five days (for instance, tapping the same one five days in a row, or tapping five compatible amiibo within one day), and resets after you get one of the items. While you can get unlimited amounts of the Champion's Tunic or Hylian Shield, there can only be one Master Sword. The chests summoned by Legend of Zelda amiibo are styled after the chests from The Legend of Zelda: Breath of the Wild and play the "discovered-a-secret" chime from the Zelda games, while non-Zelda amiibo summon Skyrim-styled chests and are accompanied by chanting. This page was last modified on 14 April 2019, at 16:22.